Lifted the engine and gearbox this morning, it was easier than expected and with the added bonus of no cuts or bruises. A big thanks to Andy from work who kindly loaned me his crane. In preparation for this I asked a couple of other Marcos owners the best way to approach this job i.e. split the engine from the gearbox or remove as one whole unit ?, the main problem appearing to be a chassis rail that runs across the upper bulkhead over the middle of the engine/gearbox which could foul it on lifting, basically i needed to lift the engine end, push car backwards to get the gearbox under this rail and then lift again, a big plus was that i had no shiny bodywork to worry about scratching. Using an old seat belt, i tied this onto a lifting eye already attached to the front of the engine and also onto the Alternator bracket on the other side and having undone the 2 engine mounting bolt screws and gearbox bolts i tried to raise the engine however the car started to raise with it, the chassis being stuck on the engine mount bolts, i then removed the engine mountings from the block and immediately the engine swung free and was supported by the crane. 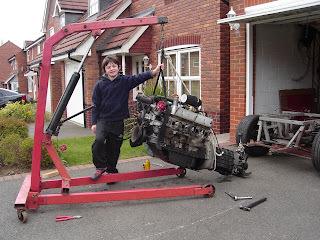 We (me and Louis) then raised the engine end as high as we could and let the gearbox rest on the floor at about a 60 degree angle , it was then a case of raise engine an inch, push the car backwards a bit, raise another inch and again wheel the car backwards until the gearbox passed under the bulkhead chassis rail. It was suggested to me that i might have to remove the crankshaft pulley but managed to get enough angle on the raised engine to avoid this problem. Over the next couple of weeks i shall remove the rest of the running gear from the car and can then start to look at getting the chassis repaired and the options on keeping the dreaded rust away.